Poland is getting more and more popular every year. The medieval towns, rich history, low prices, amazing food and alcohol and affordable accommodation attract many visitors. Also, Wieliczka Salt Mine and Auschwitz Concentration camp are known in the world. But not everyone should visit Auschwitz and it shouldn't be treated as a tourist destination. If you want to know why, have a look at the article about Auschwitz below. However, there are some magnificent places which are not well known - like the trails in the pristine Tatra Mountains. Except from the famous Morskie Oko lake trail (which is the least attractive), the other trails are virtually unknown to foreigners. And they're like paradise - filled with crystal clear lakes and surrounded by snowy peaks of the rocky Tatra Mountains. Visit also some off the beaten path, beautiful villages in the East of the country and other, less know cities. Although Rysy is the highest peak in Poland, it's relatively easy to climb it to the top. The hike is quite tiring and steep; nevertheless, it's nowhere near as difficult as some other trails in the Tatras - like, for example, the trail to Zawrat via Dolina Gasienicowa which is my favorite in the whole Tatars. As an interesting fact, I can mention that the Rysy peak is also a border crossing point - you can easily go down to the other side which is in Slovakia. The Slovakian side of Rysy is easier but less spectacular. As both countries lie within the Schengen zone, of course, there are no guards or barricades; you won’t even notice you’re in a different country. Many of the visitors coming to southern Poland and Krakow region end up in Zakopane - the little town located at the foot of the Tatra Mountains. Some hike (or take a horse cart ride) up the easy and quite boring trail to the most famous landmark in Polish mountains - Morskie Oko lake which is undoubtedly picturesque and beautiful, but so overcrowded that it can get really irritating. In this post, I'll try to encourage you to leave Morskie Oko behind and venture into the real, wild beauty of the area. As usual, the most attractive and stunning views are awaiting those who are brave enough to take a risk and explore something beyond the beaten path. I've already described the trek to Dolina Pieciu Stawow which is way nicer than the one to Morskie Oko and now it's time to write about my favorite trail in the Tatras - to Swinica peak via the less known Dolina Gasienicowa (Gasienicowa Valley) and Zawrat saddle. 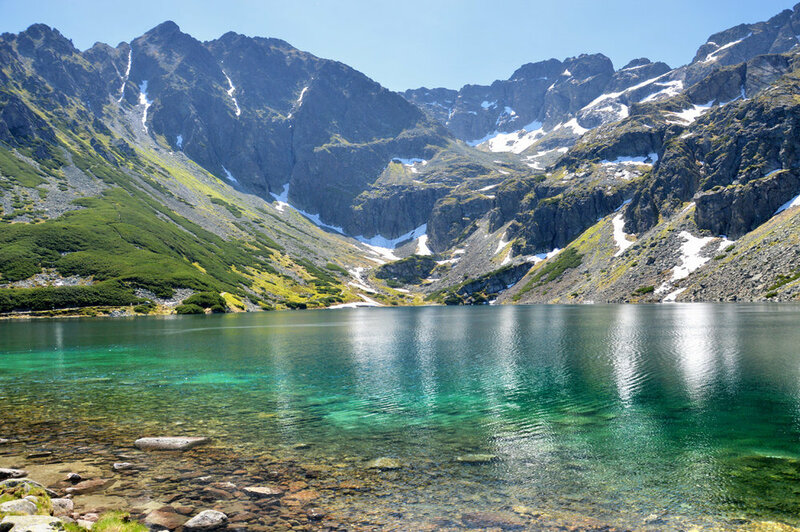 This trail features not one but several crystal clear lakes of different shapes and colors, spectacular views - incomparable with those on the way to Morskie Oko and it's perfect for those who love adventure and adrenaline rush! This article will probably be a bit off topic but I felt a need to write it after a visit in one of the world's most infamous sites. 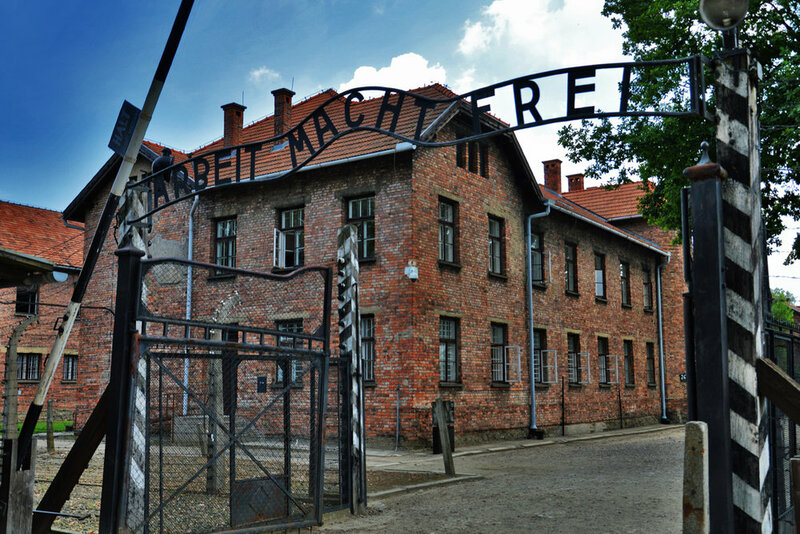 Auschwitz Concentration Camp in southern Poland has recently become one of the most visited tourist attraction in the Krakow region. However, in my opinion, it should never be perceived as one. The site of incomparable genocide that was committed by the Nazis during the second world war should be seen only if you fully understand what really happened there and what consequences it entailed for those involved in those horrific events. Europe is a greatly diverse continent - most of it has the 4 distinct seasons and is visited by the travelers either in summer when the weather is great or in winter - for skiing. Autumn colors are also beautiful and attract those who like nature and hiking trails. But where to go in March or April? The winter snow is gone - leaving behind the grey, nearly black and white world, the weather isn't too great either and in the south it's still not hot enough to enjoy the beach. However, there is one place, hidden in Polish Tatra Mountains where the best time to visit is the early spring. 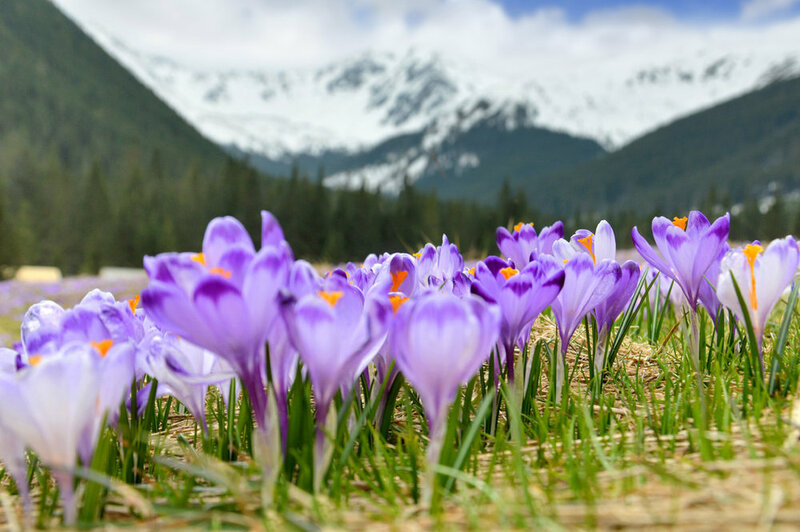 For around 2 weeks, when the first, warmer sun rays after the winter months melt the snow lying on the slopes, hikers near Choholowska Valley might have the luck to experience a magnificent wonder of nature - when millions of purple crocuses appear turning the gloomy, post-winter meadows into a bright, colorful carpet. 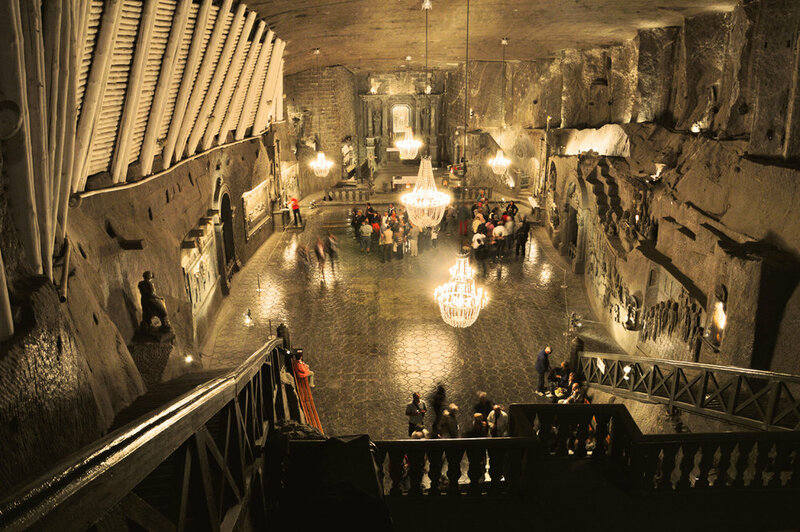 Wieliczka Salt Mine, located just 15 km (9 miles) south of Krakow - the most visited ancient Polish city - is also one of the most popular attractions in the region. Founded in the 13th century, it was in operation until as late as 2007. Visitors can admire many absolutely stunning, carved out using only man power shafts, corridors and chambers that have been lavishly decorated by tremendously talented artists. All the sculptures, statues, reliefs, walls, floor tiles and even chandeliers are made of salt. A walk down the long underground passages of Wieliczka is a great history lesson in practice, not only in theory. Read on and I'll give you some tips on how to best enjoy the visit. The route to the most famous tourist attraction in the Tatra Mounatins region - Morskie Oko lake may be the most popular and the easiest (and also quite boring), but the most spectacular views and real alpine, mountainous scenery are available to those who decide to hike the trail to Dolina Pięciu Stawów (The Valley of Five Lakes) and onward. No crowds (comparing to city-like traffic on the path to Morskie Oko), unspoiled nature, amazing landscapes and freshest air. It is also possible to reach Morskie Oko valley itself through the Valley of Five Lakes. This route is both: so much better than the normal, paved, road trail to Morskie Oko and and also pretty easy to follow. Cracow (Kraków in Polish), due to its location, went through enormously difficult times in both ancient and recent history. Squeezed between the Europe's most powerful empires, it suffered invasions, raids and pillages from all directions. Miraculously, unlike Warsaw - the Polish capital, it survived the atrocities of the second world war almost intact, therefore, you can still sense its medieval charm strolling down the colorful cozy streets or having lunch in the largest medieval market square in Europe. Zakopane is the winter capital of Poland and also one of the country's most popular resort towns in the summer (I've described it here). Due to proximity of Krakow, the ancient Polish capital, which, after Schengen Agreement suddenly became a popular tourist destination, Zakopane has also seen a considerable rise in foreign visitors for the last couple of years. Most of people come to Zakopane for its charm, typical for the region wooden architecture with pointed roofs, Krupowki Street with many international stores, and, of course the Tatra Mountains. The best, and easiest way to enjoy the views is to get on the funicular that will take you to the top of the nearby hill, Gubalowka. There, you can enjoy some local, hand made craft items as well as delicious food while admiring the surrounding, snowy peaks. I will write a separate article about the town itself in the future, in this post I would like to focus on both: probably the most beautiful (and popular) place in the region: Morskie Oko lake, and the less visited, however, in my opinion, even greater Czarny Staw lake. Beskid Sadecki, in Malopolskie Province (or Voivodeship), is a remote mountain range with rolling hills covered with vast swathes of primeval forest. It stretches down south through Slovakian border which can be crossed while hiking. It's full of picturesque little towns and villages scattered along the streams in numerous valleys. It's also a home to many wild animals and plants, like foxes, wild boars, snakes (including vipers), lynxes, deer and even bears (although I have never heard about anyone encountering a bear). Photos that I took on a beautiful sunny day while strolling through meadows and green grass fields in the south-eastern region of Poland, Malopolskie Province near the town of Nowy Sacz. The area is rich in natural beauty, breathtaking landscapes and little villages with wooden old houses scattered among the rolling hills. In the south of the region, there are endless swathes of primeval forests cut with little streams and multiple tourist trails. It's a place where you can forget about the hectic city life and succumb to the charm of the peaceful surroundings of nature.